June 8, 2011 -- MANCHESTER, U.K. - Preliminary results from the new U.K. national CT dose survey have provided some details about the scale of the modality's continued proliferation, as well as the increasing exposure to the population from the rising number of examinations. The results were presented at this week's U.K. Radiological Congress (UKRC) in an electronic poster that proved to be the most popular exhibit during the first two days of the congress, which began in Manchester on Monday 6 June. "Particular attention is required for the robust justification of CT procedures and the optimization of patient protection, especially where patients require follow-up scans over a short period of time," wrote lead author Stuart Meeson, PhD, a medical physicist at the University of Oxford and the Health Protection Agency (HPA), which is organizing the survey. By January 2011, 36 sites had confirmed they were collecting data for the survey on at least 127 CT scanners (about 25% of the U.K.'s installed base). Up to April 2011, 74 sites had downloaded the documentation. Another 18 sites from outside of the U.K. had also downloaded the files. So far, the response has been low for pediatric CT. Also, some participants have requested a more oncology-specific follow-up dose survey. Much has happened since the last survey was conducted in 2003, the authors noted. There are now more detectors and shorter scan times, and changes to automatic tube current modulation have occurred. CT has also expanded into new clinical applications, including 3D head and colonography. CT referrals have increased year over year, as shown in the chart for England. In the U.K., about 68% of the population dose now comes from CT, whereas CT accounts for only 11% of total x-ray examinations. The per caput CT dose in the U.K. is less than five times the equivalent figure for the U.S., but in the U.K. there are typically 56 CT examinations per 1,000 people, rising to 223 per 1,000 in the U.S. 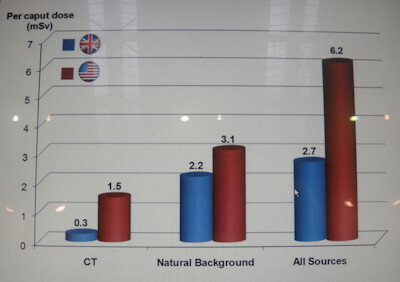 Per caput doses in the U.K. and U.S. from CT, natural background radiation and all sources. 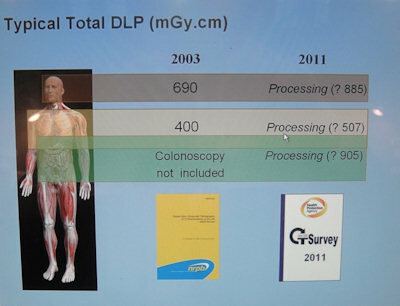 Typical total DLP data for head CT, chest CT, and CT colonography, including data from the 2003 survey and early results from the 2011 survey. The HPA started work on the survey last October. The aims are to assess changes since the last survey in 2003, provide guidance for some recently established examinations, update existing examination-specific national reference doses, and provide a baseline for potential follow-up optimization studies. It aims to collect information from as many CT centers as possible about 12 specific adult CT protocols and clinical indications, using samples of 20 patients for each protocol. Similar data were also requested for pediatric head CT examinations. Involvement of hospitals and clinics is voluntary, and no site will be traceable from publications or presentations that refer to the survey. All participants will be acknowledged, and participation in the survey is a valid Continuing Professional Development activity. Participation was endorsed by both the U.K. College of Radiographers and the Institute of Physics and Engineering in Medicine. Data collection can be either retrospective or prospective. The preferred study period for each CT center was about three months, but could be longer for low-frequency examinations, and could involve up to one year of records where performed retrospectively. 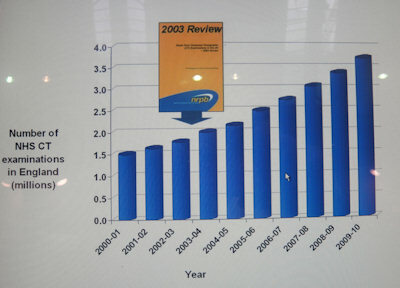 The HPA's full report is due to be published before the end of 2011. For more details, visit the CT Users Group website.